The Concrete Art Studio is a monkishly austere, quiet place to think, write and make art. Set into a steep woodland slope, it flattens to a green carpet of wetland grass: a unique break from the extensive, thick forest around it. Daylight enters this area unimpeded, so it is comparatively bright, and the studio’s northern exposure is ideal for art making. In the wetland beyond is an anomalous form – a tight cluster of long-dead trees. Over the years, they have dropped their bark, fading to silvery gray and leaning this way and that from their original verticals. We felt these angled trees provided a clue about how to set an architectural geometry into the distinctive landscape. Like the trees, the walls are angled outward, opening wide to nature, and inward, forming the secluded spaces of a sauna and outdoor shower. Thick concrete walls and floor construct this pattern of alternating inverse angles, buried in the earth on three sides to create a strong physical presence like a ruin or a series of caves. One feels held in and secure yet also projected outward into the surrounding nature. To enter the studio, one descends a path cut into the earth, arriving in a space of shadow separated from the world above. From a slot along the roof, daylight washes over the monolithic wall that runs the length of the building, organizing the circulation path. One reaches the studio space after descending a few steps further, and the last angled wall leads the eye to the cluster of weathered trees. 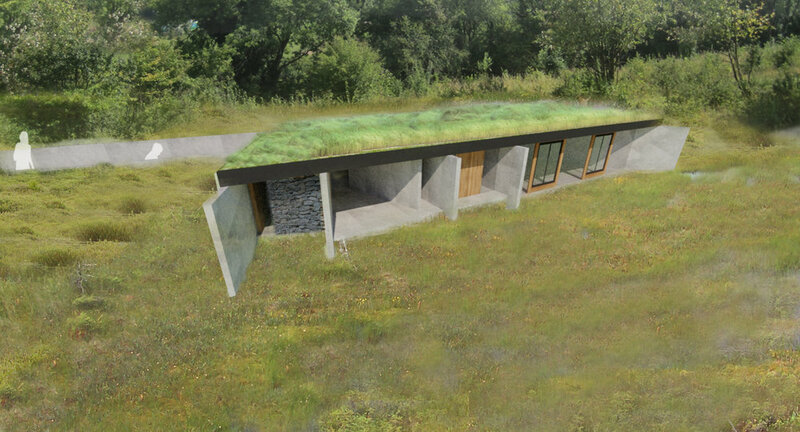 A near continuous extension of the forest floor, the roof is set just above natural grade. It’s planted with the ground cover found at the edge of the woods. 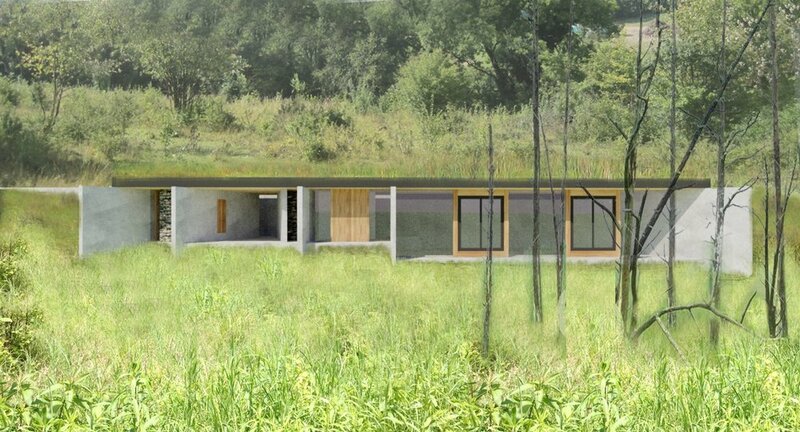 Windows and skylights open to cross-ventilate and cool the building, taking advantage of the way heavier air settles into the bowl-shaped topography where the wetland earth maintains its lower temperature.